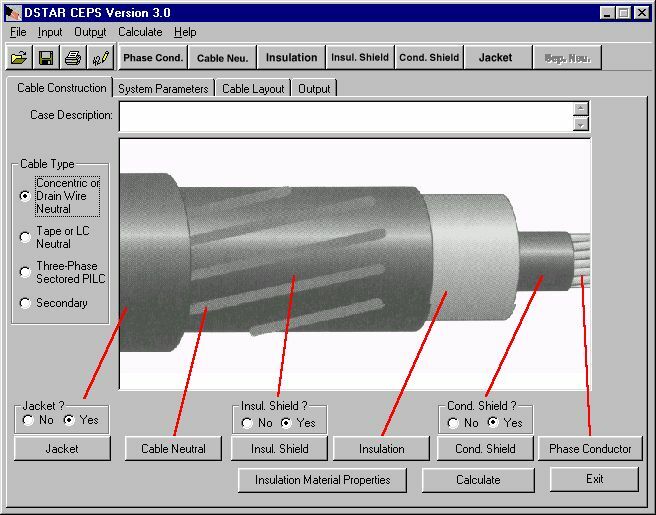 The Cable Electrical Parameters Software (CEPS) provides convenient calculation of underground cable parameters. A highly graphic user interface allows easy usage. For three-phase cable runs, the program also calculates sequence impedances where a separate neutral conductor is installed. three-phase sectored PILC primary cables. Simply stated, the purpose of CEPS is to calculate all relevant cable electrical parameters based on a set of user inputs. User inputs include, but are not limited to, cable dimensions and materials, cable layout, and cable operating conditions. CEPS will help an engineer determine cable sequence impedances for fault calculations and coordination of protective schemes. Also, CEPS will permit quick and easy comparison between cable manufacturers and cable designs. Engineers familiar with manually performing cable calculations will be happy with the flexibility and robustness of CEPS.